The VIC blended learning course is now available. It consists of: national workshops in each partner country, e-learning modules, and piloting phase. The e-learning course aims to introduce our concept and to support adult educators to plan, deliver and evaluate innovative integration learning activities and eventually to validate the integration competences developed in these learning offers. The four learning modules provide a combination of theoretical input, learning activities and a variety of examples and practical tips on how to implement the VIC-approach in the daily work with your learners. 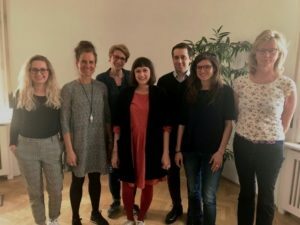 In May, the German National Agency invited the VIC team to contribute with an article to the EPALE’s thematic focus for June “Assessing adults’ skills”. 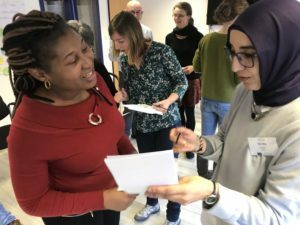 The article highlights major findings from the first research phase, gives an overview of the envisaged training course for adult educators, and explains the guiding principle for the further development work. You can find our article here. On 10./11. 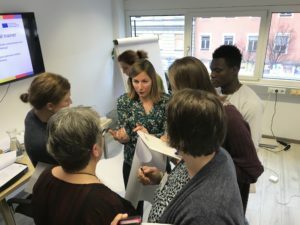 of April, the VIC partners met in Vienna and started developing the competence framework based on LEVEL5 for assessing and validating refugees’ competences related to the integration process. According to the idea that all citizens shall be equipped with a number of competences to be able to live peacefully together in a diverse society the VIC partners set up a repository of competences. VIC will develop an approach to measure the effectiveness of the educational offers that have been put in place to ease immigrants’ pathways to integration, on the one hand, and to assess their impact on the individual integration competences of the immigrants, on the other hand. Hence the project is focusing on the validation of integration competences. VIC will develop a validation system for this purpose which is based on the LEVEL5 approach. 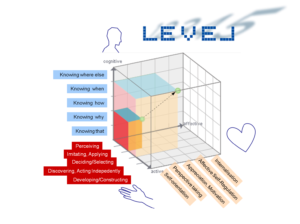 LEVEL5 is a unique system to validate competences and competence developments and to create learning environments and pathways in non-formal and informal learning contexts.